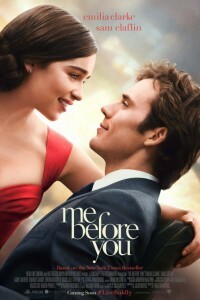 In the movie Me Before You a girl in a small town forms an unlikely bond with a recently-paralyzed man she’s taking care of. Emilia Clarke and Sam Claflin costar. Emilia Clarke plays Daenerys Targaryen, mother of the three dragons, on Game Of Thrones. Sam Claflin played Finnick Odair in The Hunger Games movies. This is director Thea Sharrock’s first feature film. She hails from the UK and has previously directed British television series such as The Hollow Crown and Call The Midwife. Charles Dance and Janet McTeer have supporting roles in Me Before You.